This ambitious and enterprising production is a surprising departure from this team’s previous venture, the complete Brahms symphonies, of which the Third and Fourth were reviewed last September. On that occasion, my colleague Rob McKenzie noted that the recorded sound “places the orchestra at a distance which tends to blunt the impact of the climaxes”. Much the same can be said for the current album, and it largely boils down to which of these film score excerpts work best in what the liner notes acknowledge as a “concert hall setting” and, it seems, a rather empty one. Familiarity of course is the enemy here, and if you know the in-your-face originals of many of these tracks, your adrenaline expectations may be short-changed. 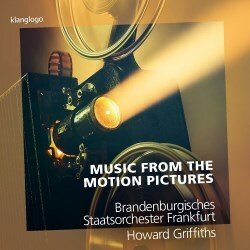 Howard Griffiths has the Brandenburgisches Staatsorchester Frankurt playing with fine ensemble throughout, and if their style seems not always to-the-manner-born, they never sound less than committed and entertaining. Opening with Alfred Newman’s 20th Century Fox Fanfare - appropriate if not novel – the acoustic stage is set, the percussive battery less than fully focussed as it fills the void. The Magnificent Seven suite is similarly short on impact, also without the snap, say, of Erich Kunzel’s with the Cincinnati Pops on Telarc’s Round-Up collection (CD-80141). Kunzel underscores the Copland-esque, while Griffiths and company are more in the central European tradition, their portamento on the big tune decidedly Viennese. In this vein, though, the Beethoven and Wagner excerpts fare well, sitting more comfortably in the venue’s ambience. The two concertante pieces – the Warsaw Concerto and Schindler’s List theme – are given a natural balance which may seem apt, but in reality the originals are more dominated by the solo instrument. Both Anastasia Voltchok (piano) and Veriko Tchumburdze (violin) play with all the bravura and pathos each piece requires, but sound a little too reticent in the mix. It’s all the more a pity for the Schindler’s List theme, with its searing but poignant narrative of human suffering sometimes competing to be heard. This pales against Itzhak Perlman’s recording with the Pittsburg Symphony Orchestra, directed by the composer (review). The James Bond: Main Theme track might have been a wise omission, being guitar-less and rather flaccid – where’s Vic Flick when you need him? Perhaps of more concern is its attribution entirely to John Barry, when it appears the Courts have ruled twice that the theme was written by Monty Norman, who has further won two libel actions against publishers for claiming that Barry wrote it. The good news is that the rest of the programme works admirably, the sonic bloom of the Frankfurt acoustic now becoming an advantage. Griffiths brings his heritage to bear on Malcolm Arnold’s Hobson’s Choice suite, while Bernard Herrmann’s Vertigo suite is by turns potent, eerie and sensual. Pulling out all the stops, Klaus Badelt’s ‘He’s a Pirate’ from Pirates of the Caribbean is a panoramic, swashbuckling romp, and the ‘Throne Room and Finale’ from John Williams’ Star Wars suite couldn’t provide a better coda. Griffiths and his charges miss nothing of the ceremonial march’s Waltonian grandeur, then launch into all those indelible Star Wars themes as the imaginary end credits roll. Make no mistake, there’s more than enough here to keep you well entertained, and send you home happy.